A fun project for pre-school and Kindergarteners. I started by bringing in several apples cut in half. I chose only the red apple to reflect the project. We talked about the color of red on the skin of the apple and the color of the flesh. How many seeds do you think is in a apple? The response was quite interesting. white and yellow paint or cream color paint. Cut out red skin of apple like a frame around the apple. I used slightly watered down glue mixed with paint to match flesh color of apple. 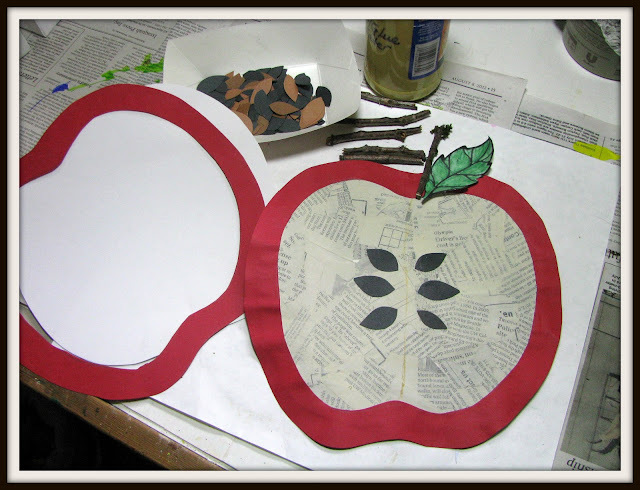 Next have the kids stick the newspaper pieces on the white apple decoupage style using the glue mixture. I had my preschoolers use foam paint brushes. The glue mixed with paint worked great. It simplified the use of glue for the young kiddo's. Next add the red frame and glue the seeds. Have the kids color a leaf or two, glue on. Add stick to represent stem! all done. If you have the time...I thought how cute it would be to sew a black zig zag down the center of the apple.. maybe next year. Note: I had to do a lot of the prep work for preschoolers. Most kindergarten and older can cut out and tare paper.